Kris Cervin is new pharm. d.
Kris Cervin has been in the pharmacy department at Paynesville Area Health Care System before. She spent time getting familiar with the facility for 10 weeks as a resident in 2002. She came to work for PAHCS in July 2003 and is currently the newest doctor of pharmacy (Pharm.D.). 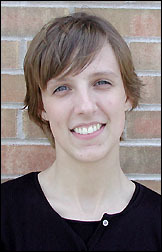 Cervin attended North Dakota State University for three years where she studied pre-pharmacy. After that she went to the University of Minnesota in Minneapolis for four years to be a registered doctor of pharmacy. Cervin is very happy to be working at PAHCS because the pharmacy practice, started by Laura Odell eight years ago, is very progressive. She is very excited to meet new patients and become part of the community. Cervin is a jack-of-all-trades. During one month Cervin sees anywhere from 50-100 patients at the clinic. She teaches diabetes management and education, helps people who have high blood pressure or high cholesterolrollterol , and assists people who have budget problems and cannot pay for all of their medication. Besides that, she fills prescriptions for patients at the hospital, sees patients at the clinic who are taking medication, and fills prescriptions for patients at the Hilltop Care Center in Watkins, and the Koronis Manor in Paynesville. In the future Cervin would like to see a support group like AA for people with diabetes. There is a diabetes team at the clinic that consists of two pharm. d.s, a dietician, and a nurse, who are just starting to think about how to set that up for the future. Cervin and her husband of two years live in Dassel. She enjoys playing tennis on Tuesdays and Thursdays, doing yoga, and running in road races.